Most of the Android flagships in 2018 are expected to be powered by the Qualcomm Snapdragon 845, the next-gen SoC that was announced officially by the San Diego-based chipmaker earlier this month. 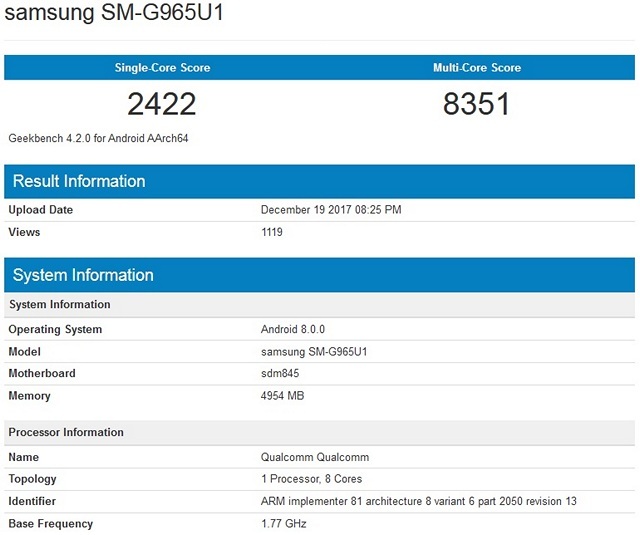 The upcoming Galaxy S9 and Galaxy S9 Plus are two such devices that are also expected to be powered by the Snapdragon 845, and while the former was spotted on the Geebench database late last month, it is now the turn of the larger device to pop up on the same website, giving us a rough idea about what to expect from it next year. First off, the device that forms the basis of this article is listed on Geekbench as ‘Samsung SM-G965U1’. Earlier reports have suggested that while the Galaxy S9 will have the model number SM-G960, the S9 Plus will have be marked as SM-G965, so the device we’re looking at today is very likely a variant of the bigger model. The listing also seemingly reveals some of the hardware specs of the upcoming device, including the fact that it will have 6GB of RAM and will run Android 8.0.0 Oreo out-of-the-box. What’s also interesting are the benchmarks themselves. As can be seen from the image, the device in question gets a single-core score of 2422 and a multi-core score of 8351, both of which are significant improvements over the Snapdragon 835, which scores around the 2000 levels in single-core tests and just over 6500 in multi-core tests on Geekbench. However, interesting as they are, they are still a long way away from the iPhone X that scores 4204 on single-threaded tasks and 10,110 on multi-threaded tasks. The device, of course, is powered by the Apple A11 Bionic chip that is widely regarded to be the most powerful and feature-rich mobile processors in the market today, so the results don’t really come as a huge surprise, especially because we kind of knew this was likely to be the case after the Galaxy S9 was benchmakred last month. In fact, the iPhone 8 and 8 Plus, powered by the same chip, actually scored even higher, even though only nominally at 4216. 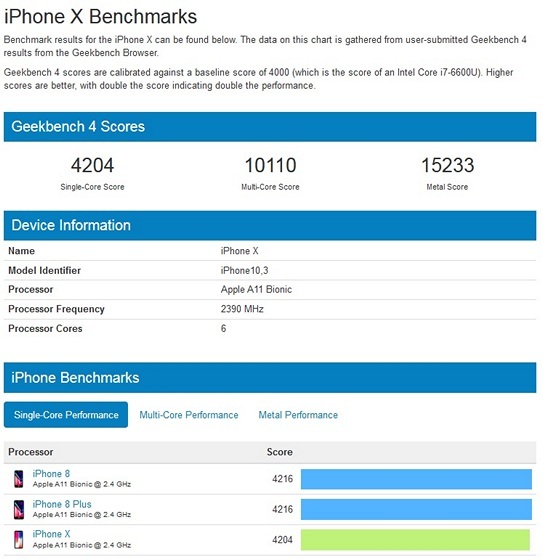 While the differences in benchmark scores tell us that the latest iPhone continues to remain at the top of the smartphone pile in terms of performance, it’s important to note that while all these synthetic benchmarks do give us a general idea about what to expect, real world performance can vary wildly from these results, so take them with a pinch of salt if you will.